Mumbai, March 27: Megastar Amitabh Bachchan recently left his stardom behind and acted like a typical excited father when his daughter Shweta hit the ramp in ace designers Abu Jani and Sandeep Khosla's creation. In a video, which has gone viral, Amitabh is seen whistling at a paparazzi and asking him to move away to let him capture Shweta's ramp walk. Big B and his wife and veteran actress Jaya Bachchan are also seen cheering Shweta. Ananya Pandey’s Bestie Shanaya Kapoor Cuts a Pretty Figure in Gorgeous Abu Jani Sandeep Khosla Saree (View Pics and Videos). The designer duo described Shweta Bachchan Nanda's outfit: "Shweta wears an ensemble from The ‘Chakra' collection. Soothing earth tones set afire with elaborate multi-colour resham and gold gota hand-embroidery in this ghagra. Worn with both a dupatta and an exquisite bandhani sari from Ahmedabad. The bandhani sari was sourced by the duo from Kamal Deep. A wonderful melange of textiles, elaborate craftsmanship and draping to create majestic beauty. Chandbalis, kadas and a romantic maangtikka designed by Abu Jani Sandeep Khosla crafted by Saboo accessorise the look." Last month, Amitabh had penned a heartfelt post for his daughter as her debut novel "Paradise Towers" had become one of the best-selling fiction books. 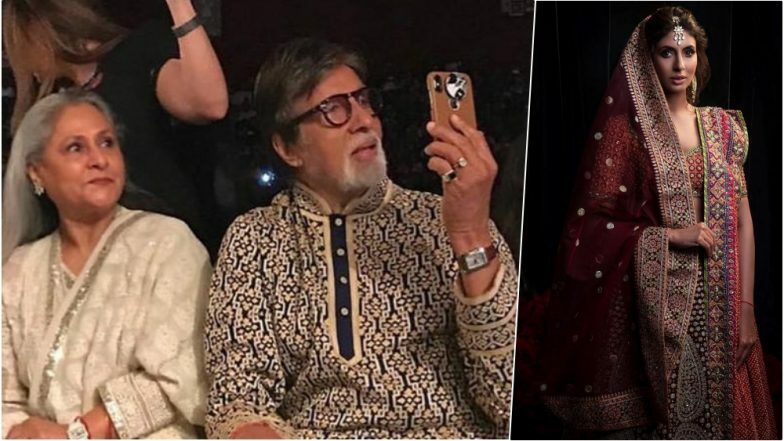 Big B took to social media and wrote: "Nothing brings greater pride to a father than the achievement of a daughter. Daughters are special." On the work front, Amitabh will be next seen in "Brahmastra".